Thank you to American Art Review (Sep/Oct 2018 Issue) for doing a feature article and cover on the artist, Don Stone. Don was a great painter and a good friend of mine in his later years. Don and his son, Caleb came to paint in West Swanzey a few winters back. We drove to my friend Tom Minnich’s sugar house and while Tom boiled the sap into syrup, Don, Caleb and I painted. 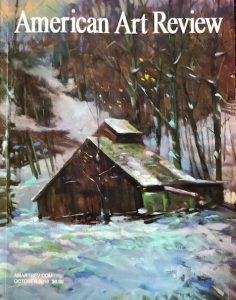 Don’s painting “Tom’s Sugar Shack” as shown on AAR’s cover is a result of that day. Don was always a lot of fun to paint along side of outdoors. He would tell jokes while we painted; usually the same ones over and over but they would always make you laugh. The North Shore art Association in Gloucester, Massachusetts is currently displaying his works in a show called “Don Stone Comes Home” and is on view through to October 9, 2018.